Did the British Really Conquer Us? The title is intended to provoke. We hear the refrain that those who came to trade conquered us and colonised us. How far is it true? Was it a one-sided conquest or did our rulers aid and abet the conquest by their actions? For instance, the 19th century historian Philip Anderson observes that the British empire in India ‘began without a strip of territory. A warehouse was expanded into a province; a province into an Empire’. How did this happen? A good way to understand this is by following a couple of early English expeditions and how they were treated by the Indian rulers. The first two voyages of the East India Company focused more on the Spice Islands in search of cinnamon, cloves and other spices. It was the third voyage which was mandated to touch Aden and Surat, to explore a market for English broadcloth. The fleet was commanded by William Keeling and had William Hawkins, the seasoned navigator who also spoke Turkish, who was expected to use his linguistic skills in Aden. They took off on 1st April 1607 with Keeling piloting the Red Dragon and Hawkins leading the ship, the Hector. While Keeling aborted his plans for Aden and headed straight for Bantam, Hawkins landed in Surat on 28th August 1608, and became the first commander of an East India Company vessel to set foot on Indian soil. Surat was the principal port of the land-locked Mughal Empire. Hawkins did not have a happy experience in Surat, as Mukarrab Khan, the Mughal officer in charge of ports was hostile to the new visitors, having been influenced by the Portuguese who were entrenched in the port. Hawkins tried to browbeat the Portuguese by claiming to hold the commission from his King; the Portuguese reply to this was:’a fart for his commission’! Hawkins then decided to travel to Agra to plead with the Emperor himself. 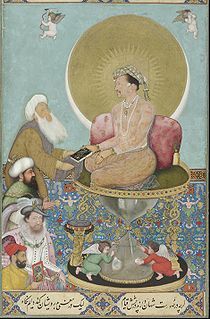 Armed with the letter of introduction from King James I to the Emperor Akbar (who had, by now, been interred in his tomb at Sikandra) Hawkins travelled to Agra and was received by Emperor Jahangir with embarrassing warmth. They soon became such pals that Hawkins became a permanent invitee to the Emperor’s daily drinking spree. The Emperor also found a suitable bride for Hawkins – the daughter of an Armenian Christian who was in the service of his father, Akbar. But for the intrigue of the courtiers who thought that the Emperor was being far too generous to the ‘Inglis Khan’, the first Englishman to have landed in India could have got half the Mughal Empire for the asking! Call it conquest? As for Keeling, he did not fare badly, either. He was sailing past Calicut when the Zamorin sent his minister to invite him offering him many inducements. The Zamorin was then at war with Cochin and was in the vicinity of Cranganore. He concluded a treaty with Keeling : As I have been ever an enemy of the Portuguese, so do I propose to continue forever. The Zamorin wanted the English to help him win over the combined forces of Cochin and the Portuguese. And in return, the Underecon Cheete (a corruption for Poonthurakkon Cheet, the name by which Zamorin’s communications are known)offered : And if I succeed in taking the port of Cranganore, I engage to give it to the English, to possess as their own, together with the island belonging to it, which is in length along the sea coast nine miles and three in breadth’. Further, if he succeeded in conquering Cochin with the help of the English, the cost will be apportioned half and half and ‘the benefits of the plunder thereof, whatsoever kind, shall belong half to me and half to the English’. This was more than 140 years before the Battle of Plassey which is described in history as the beginning of territorial acquisition by the East India Company! It would appear that the idea of territorial sovereignty was a western concept imported into India by the colonials in the 18th Century. Our rulers – the Mughals as well as smaller rulers like the Zamorin – had viewed the state more as an economic unit which could be controlled to extract revenue for the state. Ultimately, it looks as if our rulers were too keen to offer portions of their territory on a platter to the colonial powers in return for protection, weapons, money or even a cask of red wine, as in the case of Jehangir! Cheers!! Quite true. However, the one India we have today would not have been there had they not come. Yes, PNS. We agree. The British probably gave the territoriality to the emotional and spiritual India. Otherwise what we would have had is the present federal India without our Constitution! Thanks for the observation. I appreciate the blog for admitting (partially at least) that but for the deceit, greed and selfishness of most of the erstwhile rulers of various states, we would have never been subdued by the British and other colonists. But though they transferred a lot of wealth and riches to their countries, at least they gave back so much in return : administration, communication, education, dignity for the oppressed, and above all a great country called ‘India’ . Compare this with the greed of the present day colonists (unscrupulous businessmen, officials and politicians) who continue to loot our country and have never given back anything in return. This was a time when there was no India and the land was but a multitude of small nations.If you look at it from that view, there were alliances and relationships, and there were small and big enemies. The question was if you would be swallowed or seek a chance to swallow the smaller.In Malabar the code of war prevented the swallowing part, but there was still a fear that it might happen in some cases. It is a surprise that Malabar existed for some 600 years as it did, but was all completely undone when one of the rulers invited and settled the foreign enemy , the frank in their own land, namely Cochin. As is typical the Zamorin tried to find somebody else to be on his side I suppose, like the English. But the inability to maintain these relationships or the lack of farsightedness during the rule of the medieval is tragic, not just Malabar, but all over today's India. They were simply overwhelmed or allowed themselves to be run over by enemies or conquerors who had little to boast of. Sad I suppose, from a ego and pride point of view. But would we have been better off if on the contrary? Thank the Raj for all that they have done in Creating what we call Bharath-INDIA. Thanks Devasahayam for the comment. The thesis was that conquest was not a one-sided affair and internecine feud was as much responsible for the nation having been conquered by the British. There is no denying that the conquest has benefited us immensely by integrating our country both internally and externally with the comity of nations. Yes, Maddy. It is perhaps pointless to speculate on what would have happened had we stuck together as one nation. The point is that the ethos of that era was somewhat different and the concept of a nation (Bharatavarsha) existed only in the puranas or in the enlightened thoughts of saints like Sankaracharya! Thank you, Radhakrishnan, for the comments. We cannot agree with you more. Be a regular visitor - we like to hear what you have to say!